28 ct. Sage jobelan (stitched 2 over 2) from Wichelt Imports. Alternative fabrics: 16 ct. Sage Aida or 14 ct. Sage Aida. 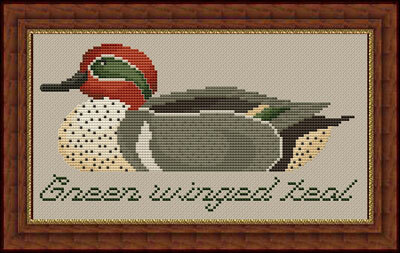 Stitch count is 119 w x 63 h.
Format: 8.5" x 11" chart pack contains the graphs for both right and left facing decoys. This design can be easily converted to needlepoint. copyright © 2003 Whispered by the Wind, LLC.